Interview tips, professionalism, advice to help me be successful in the work force, and more: these are all the things I gained from the Bridger round-table on January 12th. At this meeting we were given the opportunity to network one-on-one with professionals from different fields, where they gave us tips on how we can succeed in the workforce and find a job we really love. It was such a great learning experience for me as well as my fellow Bridgers. Through our one-on-one sessions with the professionals, we were able to build on our skills and grow from that point forward, no matter our skill level before coming to the meeting. Given that we are seniors in high school, preparing for college and the work force can be a stressful and daunting task. However with the help and resources that Youthbridge has given us, we are actively obtaining the skills we need to succeed. One of my favorite moments from this meeting was being able to meet professional people who had been in the same situation as I am now. Even though they were unsure of what they wanted to do with their future, they still went on to become successful in their fields. We got the opportunity to get up close and personal with these individuals and it was awesome. We asked questions like "how did you know what you wanted to do?" "Was this your first planned job or is it the back up?" Questions like these were asked by all the Bridgers, and everyone mentor in the room had their own unique response. Overall this meeting showed us that it is possible to be successful in whichever field that you desire, and it has given us skills to make us better equipped to enter the world. Check out some photos of our amazing roundtable below: Full album can be found here. On Friday March 17 over 120 students from 15 high schools across New York City came together for a day of community organizing, learning, and strategizing about issues in their communities at the annual YouthBridge-NY Leaders to Leaders Youth Summit! The day was an overwhelming success and we look forward to seeing the impact these students will have on their communities. Student leaders learned some new skills on March 17 at the annual YouthBridge-NY Leaders to Leaders Youth Summit. The conference brought up some serious topics including cyberbullying, women's rights, and gun violence which left them with new perspectives. The conference which is held in Manhattan gathers high schoolers and community-based organizations from all five boroughs. Through workshops the staff trains them to find problems in their communities and make changes through the lenses of diversity. During the day the leaders had case study sessions with company owners who made changes of their owns. They then had to ask their own questions about their communities and how they could make changes. After these there were skill building sessions where teamwork, advocacy, marketing, and campaigning were taught by the case study professionals. One workshop was led by Art and Resistance Through Education. This company described the importance of fighting problems such as sexual trafficking, child slavery, and immigrant discrimination. The case study was to create an art project such as a mural, advocacy project, or public event for common neighborhood problems. One group created a idea for an annual walk to raise awareness for domestic abuse. Another workshop was about identifying cyber bullying. This facilitator taught everyone how to identify problems, goals, deliverables, allies, opponents, and tactics. The students walked away with plans for assemblies, mandatory lessons, consequences and other calls for action to take to their schools. After the training sessions, there was keynote speaker Katherine Chambers, a transgender activist and educator. She taught the students to not give up and not to discriminate. The conference was then opened up to a question and answer, a raffle won by a Midwood student, and a planning session. It was announced that there was a community project competition for those at the conference. Khan plans to use the lessons from her workshops to create a documentary style video about Midwood for her community project. While being fully informed that we, the YouthBridge community, as well as the rest of the world, are well into 2017, leaving behind that rather atrocious year of 2016, it has also occurred to me that we look at the past in an overwhelmingly negative fashion. When asked to recall major events in the 20th century, one’s mind instantly springs to the World Wars and other major conflicts, while early American history is stained by the prominence of slavery. However, 2016 was the year when our current YouthBridge fellows assembled, with varying methods to achieve the ultimate goal of poised, informed, and directional leadership. For the Shared Resources for a Shared Future committee, our past three meetings took us from December of 2016 to February of a more optimistic 2017, yielding great personal and communal growth across all areas. The December meeting was, personally, one of my favorite, for we were able to see the direct impact of the grant for which we are currently responsible. Wendy Kaplan, a social worker at the Trinity Place Shelter, the recipient of the grant last year, held an open forum where she discussed the mission of the shelter, her role in the operation, and the various successes that the shelter enjoyed. It was heartwarming, to say the least, to hear about people who came into the shelter hopeless and rejected, and left confident, independent, and with a stable-income job. To understand that our grant directly translated to the consolidation of such a beautiful community gave heightened gravity and importance to our mission in the SRSF committee, bolstering the already-known fact that our actions and decisions have the real ability to change lives. Crossing into the unknown territory of 2017 on an inspiring note, our meeting in January focused on amending and updating the application for our grant, as to make it more user-friendly, accessible, and telling. Personally, this experience was wholly foreign, in a very satisfying way. Often, we YouthBridge fellows find ourselves on the exact opposite side of the application process, putting ourselves out there and overzealously expressing interest through a plethora of essays, so taking a seat on the proverbial high chair was, at first, different. However, I soon became used to the authority and welcomed it; applicants would be answering our questions and giving us the proper information necessary to make an executive decision. Nothing tyrannical occurred, despite the wealth of power we all had at our hands, and the experience offered us all crucial insight into the other side of applications. To our most recent meeting in February of 2017, I grant the superlative “most satisfying”, for one mundane reason: interviews. These are those feared events that begin in a misleadingly confident handshake and culminate in, more often than not, tears and reconciliation (not in YouthBridge’s case of course, my interview was rather lovely). As the second stage for applicants of our grant is a mandatory phone interview, this exercise was simultaneously necessary and revealing, for questions, answers, and reactions, to me, all seemed rather authentic. Three characters presented themselves in a mock interview: the interviewer, interviewee, and the disruptor. I, of course, took on the role of disruptor without much hesitation. I then proceeded to, as my formal title suggests, annoy the interviewee without much remorse, as to replicate a real-life situation in which Murphy’s Law was continuously applied. All jokes aside, this committee session was crucial to the progression of our grant, as we learned how to effectively conduct a phone interview and respond to any hindrances that may present themselves therein. The current state of global affairs notwithstanding, 2017 looks to be a prosperous and productive year for the SRSF committee, where we’re able to positively and profoundly impact the lives of many, while also developing our understanding of the beauty of diversity in NYC and the world. 2017 sure is looking good. communications, advocacy, and organizing oh my! YouthBridge-NY brings a diverse group of teenagers together to engage in multiple workshops with influential people. Throughout the past three skill-building meetings in December, January, and February, I have grown and learned new ways of communicating with the public on different levels. In December, we were able to meet with Ivy Cohen, a YouthBridge-NY board member, who owns her own marketing and communications firm. She taught us all about communications and marketing to different audiences. I especially liked learning about how businesses catch their audience's attention in places like stores or movies. She taught me that even simple things like placement are important in marketing. The knowledge that a store cares about everything you feel from the moment you walk in, made me as an everyday shopper wonder what catches my eye so easily and the strategy behind it. In January our topic of discussion was community organizing -- how we can bring together our community around an issue we care about. This topic gave us a lot to discuss as it had to do with politics as well and the groups that we place them in. We discussed strategy in community organizing, for example, thinking about our audience who we would reach out to based on a specific idea or project we have. However, this discussion made me feel kind of like I was categorizing people as good or bad based on whether or not they agreed with me. In February we learned about advocacy and the tools that we can use around us to make a problem known and then to solve it. In our brainstorm on methods of advocacy I noticed that we all came up with the ideas of using social media, conversations, and posters to advocate for people who cannot let their voice be heard. After our brainstorm we split up into groups and used improvisation exercises to touch on different situations where advocacy could be used. This was really helpful. I also learned that every day we are advocating for people in our community. Fellows get a crash course in the world of marketing and communications with YouthBridge-NY Board Member Ivy Cohen. 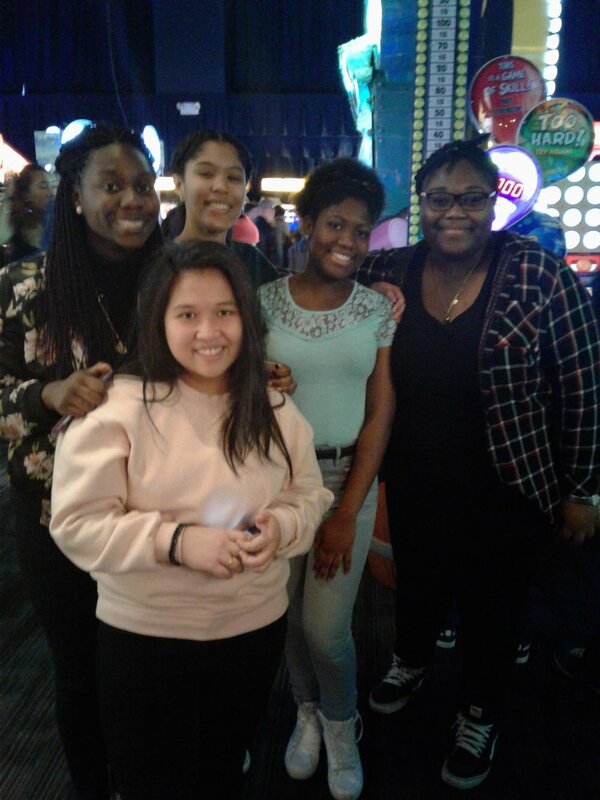 The Dave and Buster's event was a wonderful experience! It was great seeing everyone again, especially the Bridger's who we don't see as often. Everyone who came to the event was given a playing card with unlimited games and credits to play each game in Dave and Buster's. It was so fun playing against each other and earning tickets together. Seeing everyone having fun and enjoying themselves was an awesome sight. I spent most of my time playing games with everyone and hanging out with people. I was also with a group of Bridgers, and we were trying to earn a lot of tickets so we could get a really good prize from the prize store. This experience was so fun because of all the laughs we shared and the memories we made together. It was so nice to see all of YouthBridge come together as one! 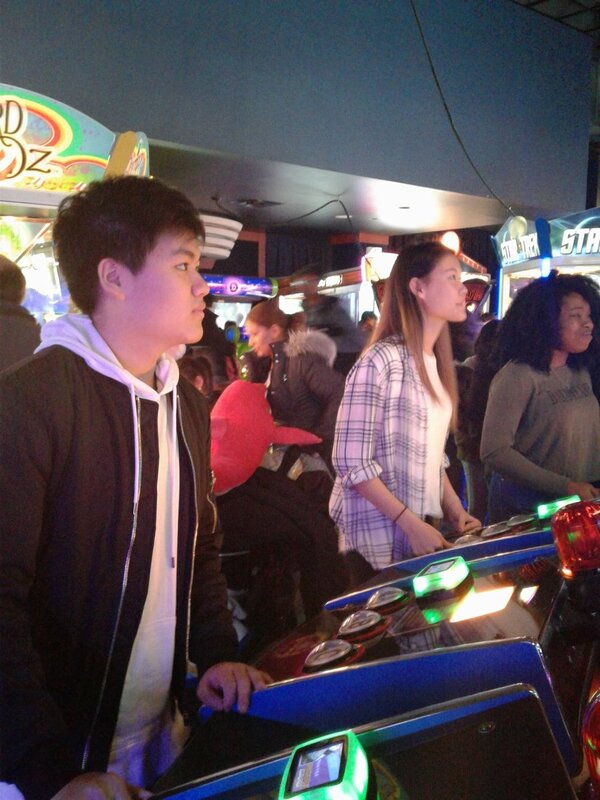 Photos from the Dave and Buster's event can be found below. For frequent updates, photos, and information like us on Facebook and follow us on Instagram!